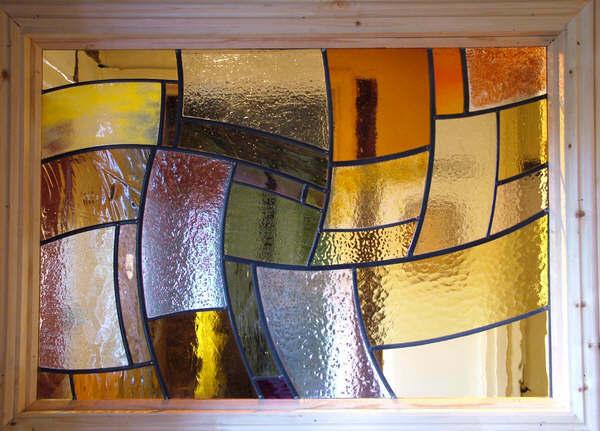 Warm and Wavy Fused Glass and Leaded Window, Sheet, Hampshire. The design for this window was inspired by the very old structure of the building into which it is now fitted. The panelled wattle and daub in the ancient cottage is very wavy and full of charm. The customer had plain reeded glass in this opening between the hall and dining room which served a purpose but was very uninspiring. The sun falls through the window in the afternoon bringing a warm glow to the room. In the panel I have included some kiln formed elements of fused glass to echo the paint finishes and the tiled flooring already present. The result is a happy mix of contemporary design with the customers own colour scheme. We love the result and really enjoyed making the window!